The major Western cement companies are retreating in Asia. Their withdrawal follows their deteriorating performance and falling operating margins (Figure 1) across most, if not all, of Asia in the past five years. There are changes they can consider, however, including changes to operating models in order to thrive in Asian cement. LafargeHolcim has sold its entire businesses in Vietnam and Sri Lanka and substantial chunks in India, with many more assets across APAC rumored to be for sale. CEMEX has exited its small businesses in Bangladesh, Thailand and Malaysia. HeidelbergCement has stated “new countries in Asia” are “clearly not on the agenda” in its Vision2020 strategy; and CRH has changed its reporting structure, relegating the previously stand-alone Asia region to the European Materials business unit, perhaps de-emphasizing the importance of the region. What is driving the exit of these global giants? To understand why Western cement majors are withdrawing from Asia, you need to look at their history in the region. Their entry was facilitated by two capabilities — technology and money. As emerging Asia developed economically, it demanded more cement, and the Western majors were the natural technical partners to support this growth. Asian governments welcomed them, especially when they partnered with local companies to build manufacturing facilities. These big global companies were an important source of money when countries did not have the means to build a capital-intensive industry on their own. They also provided rescue capital during times of stress. 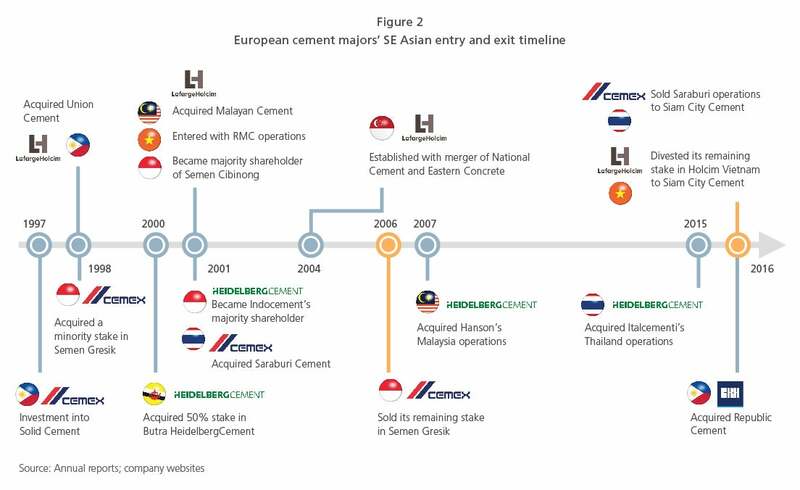 In the aftermath of the Asian financial crisis of the late 1990s, HeidelbergCement, CEMEX and LafargeHolcim (and its predecessor companies) invested in Indonesia, the Philippines and Malaysia, aiding economic recovery in the region. By the end of the past decade, most of emerging Asia’s cement industry was dominated by oligopolies of one or two Western firms combined with a couple of local firms. These disciplined oligopolies were able to manage the economic and construction cycles effectively, optimizing both supply and demand, thereby maximizing their prices and margins. This allowed the local and foreign manufacturers to earn attractive returns on their investments. Western cement majors no longer have the advantage of superior technological prowess and a large supply of accessible capital. As Asian economies have matured, the need for Western technology has diminished. Local cement manufacturers have been able to hire technically trained talent (often from Western manufacturers) or have built their own technical capabilities over time. The emergence of Chinese cement ecosystems, with their own technology, equipment and contractors, provides Asian entrepreneurs a viable alternative to Western technology, generally at a lower cost. As Asia and its wealth has grown, local firms have built both capital reserves and the confidence to do things on their own. Ironically, it is now the Western cement players that are financially stretched. While this is often cited as the reason for their exits, cement players are long used to cyclicality of margins. 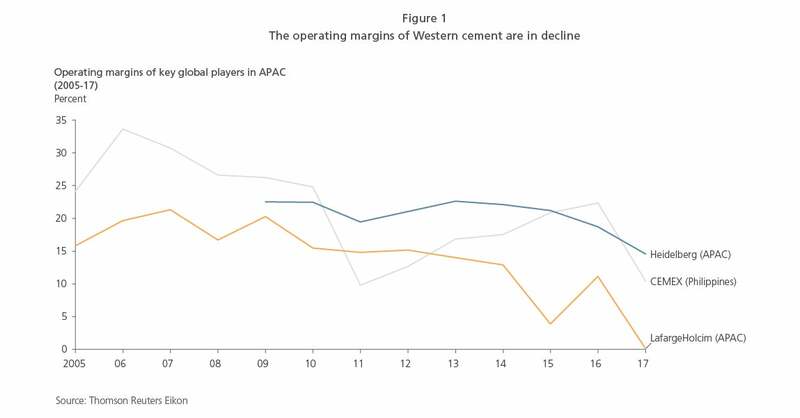 In fact it is the structural change in the nature of competition in cement markets in Asia that has altered the long-term fundamental attractiveness of the region for the Western cement majors. The local conglomerates: The local conglomerates are usually involved in real estate, construction or infrastructure, so cement production is a key node in vertical integration that assures security of supply, particularly in boom times. These conglomerates, such as YTL in Malaysia and San Miguel in the Philippines, are not only fiscally capable but also able to attract top cement talent from around the world. Critically, cement production is not the only source of profit for these conglomerates, and they can use cement as a loss leader to benefit another part of their value pool. The Asian cement giants: The state-owned Chinese players and other Asian majors such as Siam Cement Group from Thailand have deep expertise, deep pockets and significant flexibility in operating in Asian environments and are not bound by quarterly earnings calls, giving them an edge over publicly listed Western cement companies. With a number of new entrants, the cement markets have become oversupplied and intensely competitive in most Asian countries. The oversupply is particularly acute in many large countries such as Vietnam, Indonesia and India, and even with robust demand growth, this competition is unlikely to be reduced for a decade or more. With reduced competitive advantages and intense competition, it is little wonder that the Western cement majors are abandoning their Asian businesses. So, do these changes mean their end in Asia? Not necessarily so. The Western players will have to make significant changes to their operating models in order to thrive in this new world of Asian cement. L.E.K. Consulting recommends four key changes. First, be nimbler. In Asia, a lot of the new capacity has come from new entrants that have spotted an opportunity to make money during periods of extended undersupply, leading to oversupply in the long run. These periods of undersupply have existed because Western major incumbents take a “slowly, slowly” approach to new builds, and the internal decision-making processes in global companies is bureaucratic, with multiple approval layers. In contrast, entrepreneurial, family-owned local businesses can make decisions quickly when they spot an opportunity. The global behemoths need to decentralize more responsibilities, optimize their organizational structure and streamline decision-making processes. Second, reduce costs. With prices expected to be lower, reducing costs in cement production as well as in sales, marketing and distribution will reinforce margins. Many Asian divisions of Western cement companies are already instituting operational and commercial excellence programs to reduce their per-ton cost. These programs will likely need to be more aggressive and designed for the local context, not just rollouts of European operational and commercial excellence programs. While they should use the latest technologies and digitization tools, capital and commercial programs also need to be “despec’d” for Asia. The other cost to which managers do not pay sufficient attention is capex. The cost of building an integrated cement line with European standards and equipment is estimated to be up to 25% to 30% greater than building a plant with Chinese equipment. Clients L.E.K. has worked with on capital expenditure portfolio optimization have seen a 15% to 25% decrease in capex and a 200-400 basis point increase in return on capital without any change in equipment installed. Third, improve price outcomes. For too long, cement companies have thought of their customer segments as residential, commercial and industrial, and infrastructure. Developing a deeper understanding of their customers will allow cement companies to go beyond this simplistic segmentation to a more sophisticated needs-based segmentation. This will drive superior service and pricing opportunities. Consumer and retail companies have been doing this for years. An L.E.K. building products client was able to substantially regain share lost to imports by better understanding its customers and therefore serving them better. In consultation with L.E.K., the client created a new needs-based segmentation of its product users, overhauled its channel strategy and developed a new digital presence to better serve the target segments. This led to a 3-percentage-point increase in market share. Fourth, vertically integrate. This will require a move beyond the traditional core adjacencies of aggregates and concrete. Land acquisition challenges and extreme fragmentation make it difficult for Western players to succeed in these adjacencies in many Asian countries. Therefore, cement firms should think outside the box and evaluate opportunities further downstream, such as building larger precast concrete, modular construction and concrete products businesses. Studying their customers, channels and users’ pain points can provide new adjacencies and product lines that cement companies should consider supplying. A cement manufacturer in Southeast Asia has found great success diversifying into other products sold by its distributors to their customers. The L.E.K. Edge Strategy® provides a framework for cement companies to build new revenue streams by getting more yield from assets already in place, relationships already established and investments already made. More can be found on Edge Strategy for industrial companies in an Executive Insights, Developing Your Industrial Edge, Volume XIX, Issue 46. Western cement companies in Asia will continue to find their positions challenged in the medium term, and for some boards of directors sitting far away in Europe or the Americas, the easier decision will be to exit. However, there is no doubt the potential offered by many Asian countries is unparalleled. And each time a Western company exits, an opportunity will open up for another Asian champion.